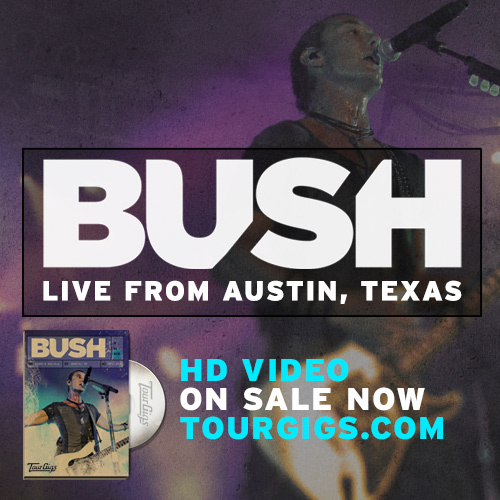 LOS ANGELES, CA – Supporting their most recent and fifth studio album The Sea of Memories, Bush kicked of their fall 2011 tour with a sold out show at Stubb’s in Austin, TX. There was no lack of moshing and crowd surfing while the band played a variety of songs from their catalog, including fan favorites “Machinehead,” “Glycerine” and “Comedown” – along with new hits “All My Life,” “The Sound of Winter” and “The Afterlife.” On one of several forays into the crowd that evening, Bush’s frontman Gavin Rossdale closed out the sweltering show shaking hands to the delight of his fans. Professionally shot with partner Blastro Networks, the video of the performance is now available to order in North America on Blu-ray ($30) and DVD ($25) via TourGigs. Three different digital formats (480p, 1080p HD, 1080p Ultra Quality) are also be available for download now – starting at $15. In addition, fans have the option to purchase individual tracks for $1.99. Check out "The Sound of Winter" from the release below. It is also available for embedding. The following video interview with Gavin Rossdale, which includes live snippets of the Stubb’s show, is currently available to view for free online. It is also available for embedding. Over the course of their remarkable career, Bush has sold more than 16 million albums in the U.S. and Canada alone. They’ve also compiled an amazing string of 15 consecutive Top 40 hit singles on the Modern Rock and Mainstream Rock charts, including 11 that hit the Top 5. Five of these became No. 1 hits: “Comedown,” “Glycerine,” “Swallowed,” “The Chemicals Between Us” and “The Sound of Winter.” In 2008, Rossdale returned to the top of the charts with his solo single, “Love Remains The Same,” which hit No. 1 on iTunes and generated more than 1.6 million downloads.